DMG Productions features breakthroughs in imaging and failure analysis. Innovations w/Ed Begley Jr. will explore ZEISS technology in an upcoming episode scheduled to broadcast during first quarter 2018 on FOX Business. Check your local listings for more information. In 1965, Gordon Moore, co-founder of Intel Corp., made a prediction that would set the pace for our modern digital revolution. Moore's Law, as we know it today, is the observation that the number of transistors in a dense integrated circuit doubles approximately every two years. Moreover, he stated that computing would dramatically increase in power and decrease in relative cost at an exponential rate. This soon became the golden rule for the chip industry. As the complexity and variety of semiconductor technologies continue to increase today, so do the challenges for manufacturing and process control technologies. With a focus on ZEISS - a company that has become synonymous with advanced imaging technologies - viewers will learn about the revolutionary manufacturing capabilities that are continuously shrinking features on the chip and increasingly incorporating more complex 3D structures to meet these rapidly evolving market demands. 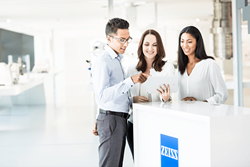 "As a technology leader, ZEISS products pervade every aspect of the electronics and semiconductor communities. From front-end world-leading lithography solutions to back-end failure analysis, ZEISS is integral to the advancement of electronics technology. From manufacturing to R&D, battery research to quality control, ZEISS supports all aspects of the growth in electronics in our everyday lives," said Dr. Markus Weber, Co-Head of ZEISS Microscopy business group. "We look forward to educating the public about the ongoing development and dedication toward technology and innovation, and how it is helping to create seamless integration of computing within our daily lives today," said Michael Devine, Senior Producer for the Innovations series.